This is not a pitch for donations.... I know that many of you here have already donated, or you have many other worthy causes which you support. I just want to honor my "team", the 2006 version is shown above - my sister in law, Karen, my brother Darry, neice Heather Sherlock (then age 12) and my sister Kelly. This year, they are joined by my brother-in-law Gary and by my neice Holly. I am humbled and astounded that they are willing to make the effort both to raise the large sum of donations required ($2000/pp) as well as making that long long walk, rain or shine. 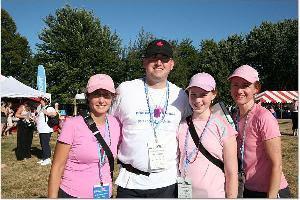 Please read their stories at the Joanne's team pages of the walk...... http://www.endcancer.ca/site/TR?team_id=24796&pg=team&fr_id=1203 I know they inspire and touch me.... and if by chance you have not made a donation, I think the grown-ups are doing fine, but the girls are a little behind. Thanks you to Holly, Heather, Kelly, Gary, Darryl, Karen. You are heroes to me. P.S. Day #3, Round #3 of chemo, a feel lousy, but sentimental and sappy sort of day! Thanks for the very kind post. Taking part in the Weekend to End Breast Cancer is an incredible priviledge. We appreciate all of the support and encouragement that we receive from friends and family. To date we have received about 125 donations. Sore feet, shins and blisters are a drop in the ocean compared to the toil of chemo. We walk to raise necessary research funds, but also to demonstrate our intense pride for way in which you face these battles. Your strength keeps us going. 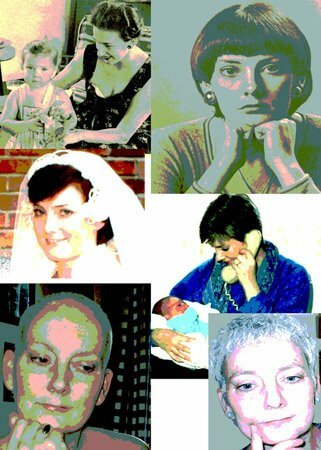 All that participate in this blog as well as those that support you in other ways are members of "Joanne's Team". We just happen to be the ones walking. Thanks again for your support, Joanne, as well as for those others who support us. Good luck to your team Joanne I'm sure they'll go you proud! My neighbour just did the Moonwalk here, a marathon across Edinburgh at night for bc rsearch. Just wanted to say a quick hello. Enjoyed your squirrel story, & the responses! My contribution is...watch out for mice..they love the unopened seeds that fall to the ground. But perhaps the squirrels will beat them to it!! We will be away from Aug 4 - 22 (with no internet), but you won't be far from our thoughts and prayers. Hope the Regina humidity has decreased. Your team is great, what a gift of awesome support.